Hey all! I've spent the last two weeks off with the kiddos and enjoying the Holidays. Now all the decorations are down, we're a week into the new year, and today we start homeschooling back up. I can avoid it no longer...the real world has returned. And I had a post all planned for today, but then was nudged to go with what I hadn't planned instead. I swear, I think God does that just to keep me off kilter and hanging on to Him. See, I hadn't planned on doing the One Word for this year. Oh, I had fun last year participating. My word was Time and God used it greatly in my life. But this year I was thinking I'd forgo it. I've been in a funk and tired lately, and simply didn't feel like seeking a word. Yeah. Great place to be, right? Not wanting to seek a word from the Lord. Well that's going to end well. Which is why I found it so interesting when He started laying the word 'abundantly' on my heart. At first I pretended to ignore it, because again, I wasn't planning on doing a word. Not to mention the word 'abundantly' scared me...did that mean I would have to live big for Him? Did He not hear how tired and blah I'd been feeling lately? Living abundantly would require much too much work. But God was persistent (I love that He loves us enough to pursue us even when we're sprinting in the other direction). 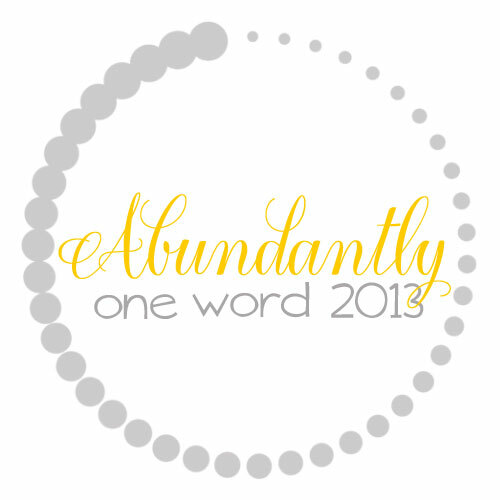 ABUNDANT - WORD FOR 2013?? But I gotta be honest. I still wasn't sold on the idea that my word was Abundantly. Nor did I have any clue why it was said word. I just had this overwhelming sense that God had chosen it for me, and I've long since learned it's better to walk in obedience, especially when He's practically shouting at you. So, even though I wasn't fully on board, I got the button made and asked Him politely to reaffirm it again. Yesterday morning in church, what does my pastor begin with? John 10:10 "The thief comes only to steal, kill, and destroy; I come that they may have life and have it abundantly." But he didn't just stop there. He took a brief moment to talk about one specific word from that verse...you guessed it; abundantly. And right there I began to understand why He chose this word for me. I'll be taking that verse apart next week, but I know it's the verse He's given me for this year to go with the One Word He's laid on my heart. Throughout the year I'll share at times how things are going. 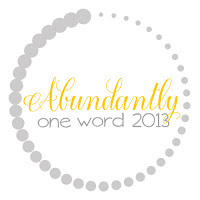 One thing's for sure...this year I'm seeking abundant life! I'd love to hear what your focus is for the upcoming year! And how the Holiday season went for you. I missed everyone! I love that God heads after us and doesn't let us run off to far ahead. Looking forward to reading your posts as you unpack what it means to live an abundant life! I didn't want my word either!! Terrible, isn't it? And my word is a good word. Sheesh!! May 2013 be filled with abundance for you, Susan!! That is an awesome word, Susan! I loved the part of your post where you said, "Not wanting to seek a word from the Lord. Well that's going to end well." I've so been there. Just was last week. There was something I knew I needed to pray about and wait on God about. My instinct was to rush off a response, but I needed to pray...thing was, I honestly didn't want to hear what God was going to say to me about it 'cause I had a feeling I wasn't going to like it. Still not sure what action I'm supposed to take, if any...but I know I needed that time of listening. Love your word and I'm excited to see what God has for you this year! Why thank you. And I'll be praying for you...since I can so relate:) I'm getting excited to see what He's up to, too--even though I have a feeling it will involve some stretching on my part! BTW - congrats on your release date! Hi Susan, beautiful Word for 2013. Isn't it great when God speaks to us through others, like our pastors? I get goosebumps when that happens. I'm waiting for my Word button to be made then I'll reveal it on my blog. I read Melanie has made over 450 so far! Oh! Can't wait to see what it is!! And isn't Melanie wonderful? Wow ... Your word for 2013 hunted you down, didn't it, Susan? My word for 2013 is "Confidence," based on Hebrews 10:35. Yep. It chased me:) And I love your word--that's a hard word for me--but what a great verse. Ohhh! Enjoy getting a button from her! Her work IS beauteous! I kept thinking about a word. I even prayed about it. This morning as I once again debated if I could focus on one word for 2013, I reflected on the issues I've been praying about the last few weeks. It occurred to me that recently I'd been ending my prayers with, "Thy will be done." In church Sunday, I went over to talk to a dear friend who's mother died last week. The lady was truly a Saint, but she'd been in bad health the last few years. My friend said, she'd been praying for months that God would take her mother home where she wouldn't suffer anymore. At last my friend said, she told God she'd wait for his timing. Translation in my mind, "Thy will be done." So as of this morning I decided instead of one word, I'm going to focus on God's will. I'll try to relax and realize He's in charge. Instead of one word, I'm going to focus on ..."Thy will be done." I hope you all have a great 2013! I wasn't planning on choosing a word, but I've been thinking lately that I let myself get lazy in my relationship with Him . . . and I often think that I need to be more intentional. So, I that's my focus for 2013: being INTENTIONAL . . . in my relationship with Him, and all areas of my life.